The Most Delicious Day in Lancaster County! The annual Whoopie Pie Festival features more than 100 different Whoopie Pie flavors and is held at the Hershey Farm Restaurant & Inn, located in the heart of the Pennsylvania Dutch Country. please call (717)687-8635 x.730 or email receiving@hersheyfarm.com. Credit Card is the only form of payment accepted. There will be no refunds or exchanges allowed. 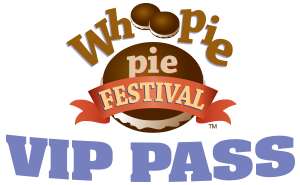 Deadline to purchase your VIP Pass prior to Whoopie Pie Festival Day is Monday, September 2nd. VIP Passes will be available to purchase on the day of the festival at the Information Tent, CASH AND CREDIT CARDS ACCEPTED. Early Admission and Instant Access is for the Whoopie Pie Retail Tent Only. Your VIP Pass will not grant you early admission and instant access to any of the shuttle buses, events, games, or food and drink lines. Please arrive at the Information Tent on the day of the festival at 9:30am to pick up your VIP Pass Package. MUST SHOW VALID I.D.